Though the 2010 Drum Corps International Tour officially kicked off on June 18, the fun has only just begun for many of the West Coast corps that got their competitive start more than a week later. With Blue Devils and Santa Clara Vanguard now in the mix, seven World Class corps top the rankings with a mere three-point spread between them. With several competitions under their belts, the Blue Devils rose to the top Sunday in Stockton, Calif., as the first corps to break through the 80-point barrier. Starting in Clovis., Calif. at the Mid Cal Tour of Champions on June 25, the Blue Devils, Santa Clara Vanguard, Mandarins and Pacific Crest began their official summer tours. Joining them were the Blue Knights and the Troopers, who had already started their competitive season in Rio Rancho, N.M. on Tuesday, June 22. "It was good to finally get out here," said Troopers director Fred Morris. "We were at [spring training] camp for three weeks so the kids were really excited to perform in front of a crowd." The theme of the Troopers' 2010 production, "Wanted," according to Morris, has become more of a play on words than on being wanted like a criminal. "Our show has evolved now to the word 'wanted;' there's the need and desire [in life] which our music portrays to each individual. Each tune could mean for the fans whatever they want it to mean." California's biggest event of the season at Stanford Stadium on Saturday caught the attention of fans across the country in a live webcast on the DCI Fan Network. Corps placements held steady in the standings, with all ensembles improving upon their Clovis, Calif. scores from the evening before. "We just finished three shows, and the really good thing about it was that they were local for us," said Mandarins corps director Jim Tabuchi. "It was good to play in front of hometown fans, because once we hit the big tour of course we see fewer parents and families. We're really pleased with how the kids are performing the show." After the DCI West event in Stanford, Santa Clara Vanguard and Pacific Crest departed from the pack, finishing their weekends at "Brass Along the Central Coast" in Atascadero, Calif. Pacific Crest showcased another strong performance of the corps' 2010 production, "Maze," and corps members will no doubt be pushing hard this season to get back into the World Championship Semifinals for the first time since 2008. Vanguard members had a solid performance putting them in the midst of the current top World Class contenders as they continue to learn and refine their 2010 production "Bartok." The weekend ended with the Blue Devils (80.050) taking first place in Stockton, Calif. Sunday night. An especially strong score in the General Effect caption helped lift the corps to success, no doubt a result of the creative use of prop mirrors in their production, "Through a Glass, Darkly." Audiences responded with excitement to the Blue Knights (2nd, 73.800), with the corps improving its score by nearly seven points in less than a week. The Troopers (3rd, 68.450) dropped slightly in score, but steady improvement overall keeps them in the hunt. The Mandarins (4th, 65.600) returned to Eastern roots with their program, "To Dream of Faraway Lands." Tabuchi said this year's production, based on the travels of Marco Polo from Western Europe to China, is "one of the most creative shows we've ever done." "We traverse the cultures throughout and explore the different musical and dance portions as Marco Polo might have traversed the continents," Tabuchi said. "It's very enjoyable to see, from the percussion doing Bollywood style features to horn line interludes and the colors and dancing from our color guard. The performers are at the point where they've learned the show and now are getting into it. They're starting to see the overall picture come out." Other corps outside of World Class also had a great showing this weekend. The 2009 World Champion Blue Devils B took first place in the Open Class competition in all three California events, followed by Vanguard Cadets and Blue Devils C. The all-age corps, Renegades, came out with 68.275 in Stockton, Calif. for a solid showing representing the San Francisco area. Also representing the Open Class, Revolution began its California tour at the Clovis, Calif. Mid Cal Tour of Champions, then traveled to Stanford and Atascadero. Velvet Knights joined up with the rest of the corps in Atascadero for its debut performance of the 2010 season. The corps performs again July 2 in San Diego, Calif. for the Corps at the Crest DCI Tour event. If you missed these California shows, you can still satisfy your West Coast drum corps Jones with on demand video playback of the Stanford show on the Fan Network. Subscriptions starting at $39 will give you access to on demand videos as well as more than 15 other DCI Tour events and soon-to-come audio performance downloads. 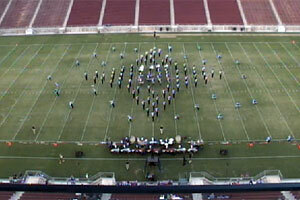 Watch West Coast performances on the DCI Fan Network.